How to Crack NEET 2020 With a Good Rank? How to Crack NEET 2020 With a Good Rank? How to Crack NEET 2020 With a Good Rank? Cracking NEET 2020 will not be difficult if you consistently work hard, regular with your classes, and complete your homework/assignments on time. Prepare a schedule giving time to all 3 subjects. You have to be extremely disciplined and focused. Avoid multitasking and don’t procrastinate. How to Crack NEET 2020? The following tips will help you to crack NEET 2020 with a good rank. Understand concepts well and practice problems. Keep an eye on NEET syllabus. Time management is the key for good score. When solving questions, improve on speed and accuracy. Clear your doubts, don’t hesitate to ask from teacher. Solve lots of mock tests including past year papers. Make class notes and follow a smart revision technique. Have a positive attitude and confidence. Don’t worry about changes in NEET pattern. NEET tests your basics. Without this ground step, you cannot rise high. Be really thorough with the concepts. You can use NCERT or a coaching study material for understanding theory and solving problems. If you are not able to learn a topic or concept, read the theory again and again till you get the feel of the topic. Talk to your teachers and don’t give up easily. Think different ways of solving problems. After solving a question, refer the solution to find if there is a better way to solve the question. You can ask the same thing from your teachers. 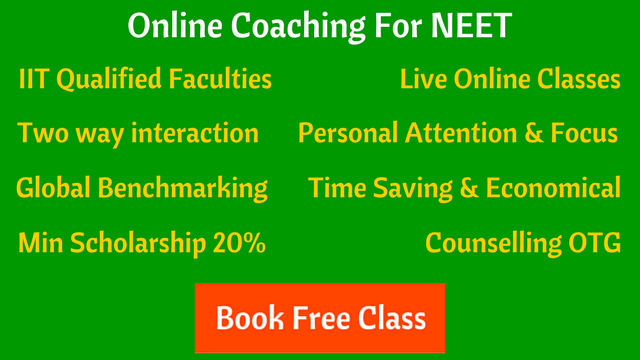 Learn topics and solve questions that are within the NEET syllabus. Don’t go deep into something which is not required. The objective is to clear the NEET examination. Work on your time management skills. NEET online test series provides analysis of tests where you can look at the time spent on each question and section. It also give suggestions to improve the score in next test. Speed is an important factor in clearing an exam like NEET. Along with accuracy, you need to learn how to solve questions quickly in less time. This comes with a lot of practice and study. Don’t neglect any topic because you find it hard to understand. Get your doubts cleared from your teachers; do not keep them pending and piling up. The best way to evaluate your preparation is to test yourself. Solve NEET mock tests, as many as possible. Solving mock tests is helpful not only in recalling facts and concepts, but in easing anxiety on the exam day. Count the marks you lose due to silly mistakes, conceptual error, wrong interpretation of any question and other mistakes. After every test compare it with the previous one. This will not only reduce your chance of committing a mistake but also it will motivate you as marks will increase. Make a notebook containing your mistakes. Whenever you make any mistake in the test, note it down in this notebook. As time passes you’ll have a collection of mistakes which you aren’t supposed to commit in exams. Revise from this copy regularly. This would help you score higher in NEET. Make class notes and review them after the class. Keep revising what you are studying. The more you revise, the more you will remember and for a greater time. A smart revision technique will save you a lot of time and boost your confidence as well for NEET. The positive attitude and confidence will help you to not panic at critical times. NEET toppers possess these qualities. They keep their calm in tough situations. Don’t worry about any new changes in NEET 2020 pattern or syllabus. Study as per NCERT and coaching modules. The concepts will remain the same. The way of problem solving remains the same. Keep your focus on preparation and nothing else.